In all the craziness of yesterday, I neglected to mention that one of our stops in Boston yesterday was at the Omni Parker Hotel, the place where Charles Dickens first read The Christmas Carol in America. 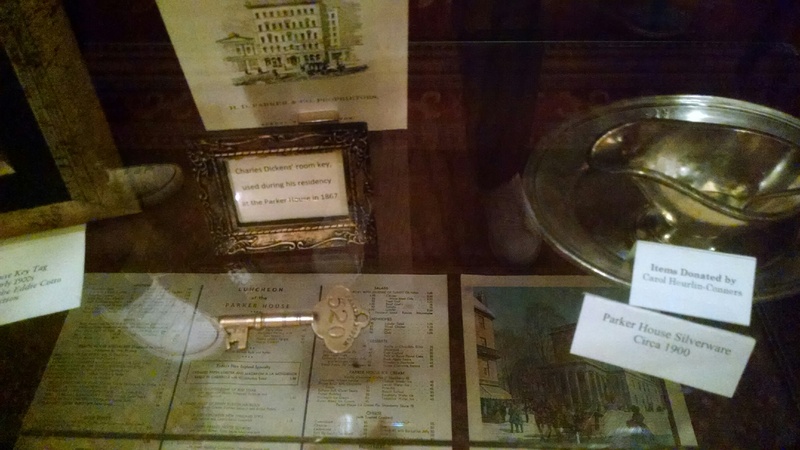 Below is a picture of the key to his room (520) where he stayed. While scarce other details exist of his time here, we do know that he consorted with the other Boston-area literati for a few weeks as a special guest of the Saturday Club at the Parker Hotel. 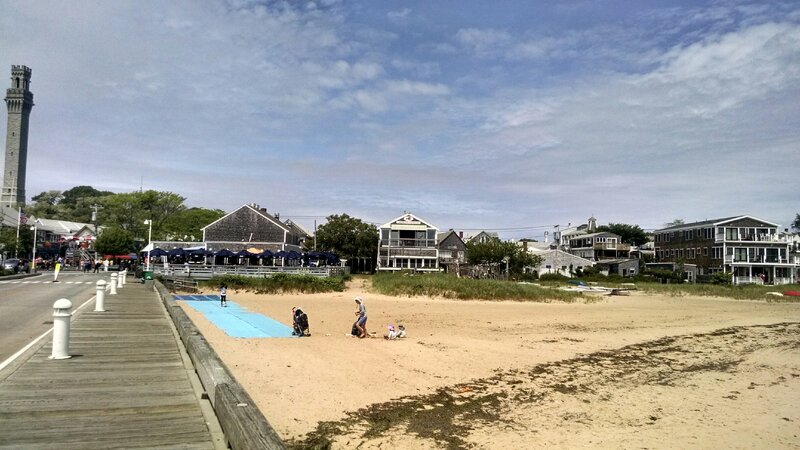 Today our travels took us to to Cape Cod, through Plymouth (yes, the Plymouth rock really does exist) and then onto the 1620 site of the first actual Pilgrim landing near present-day Provinceton, Massachusetts. This delightful town, with its requisite fudge and Christmas shop, is a teeny bit touristy but decidedly more chic than the usual beach spot. 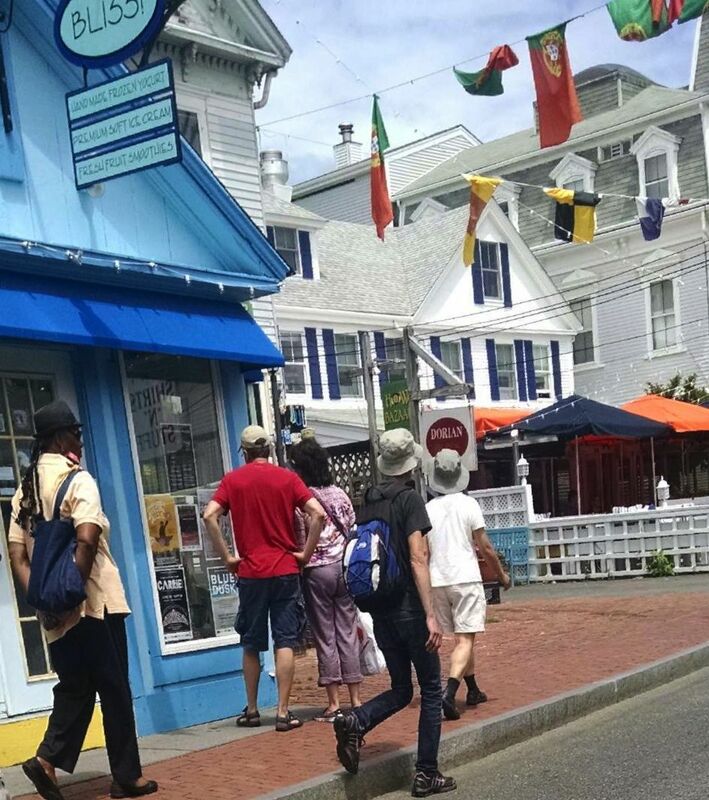 It’s full of art museums, walkable streets, and people sporting T-shirts that say: “If my dog doesn’t like you, I probably won’t either.” Needless to say, Jen, our beloved curmudgeon, has already disappeared and Ann, sporting a fashionable new beach hat, is also making her way through the streets. A view from MacMillan Pier, back toward town and the Pilgrim Monument, dedicated in 1910. 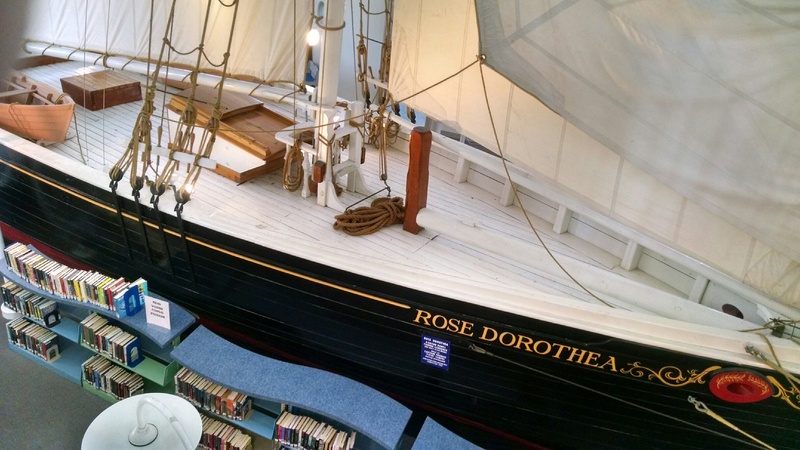 As for me, I perched on a bench outside the Public Library, and enjoyed a bit of gelato before moseying inside to capture a shot of the half-replica of the Rose Dorothea Schooner, which is permanently wedged inside and surrounded by bookshelves. Other literary points of note include the nearby homes of Norman Mailer and poet Mary Oliver. Supposedly, and maybe Jen has found it already, there once was a shack on the beach where Tennessee Williams put the finishing touches on A Streetcar Named Desire and where Marlon Brando auditioned for the part of Stanley. 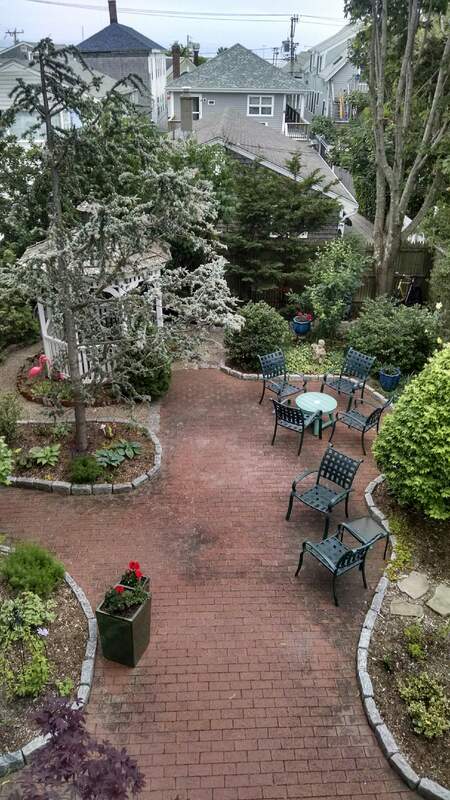 We’re headed for Connecticut tomorrow so we only have one night in P-town, but we’re delighted to be staying in the most charming B & B of the trip, A Secret Garden Inn. Below is a view from our balcony, where you can hear birdsong, accordion music, and feel the sweet ocean breezes. 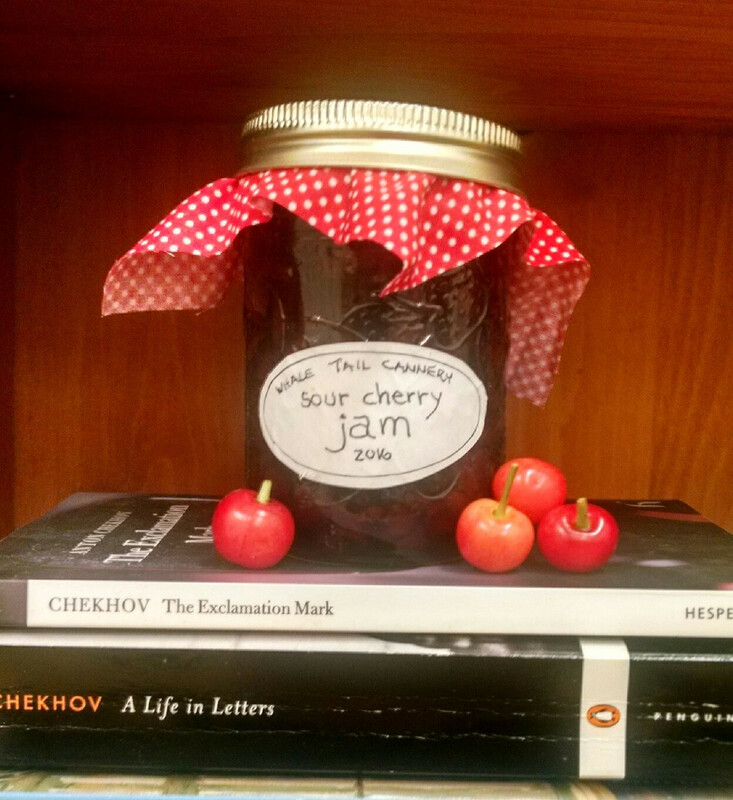 This entry was posted in Uncategorized and tagged a christmas carol, a secret garden, boston, charles dickens, gelato, macmillan pier, marlon brando, mary oliver, norman mailer, omni parker hotel, plymouth, plymouth rock, provinceton public library, provincetown, rose dorothea schooner, streetcar named desire, tennessee williams, the saturday club on June 16, 2015 by Ashley Memory.